UPDATED NORTH GLENMORE HOME WITH A DETACHED GARAGE/SHOP!! 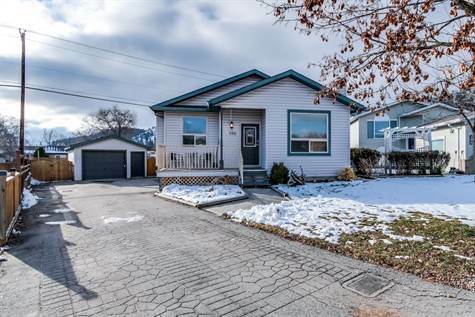 This perfect starter family home with a very functional floor open plan for easy entertaining and lots of outdoor deck space to enjoy the Okanagan summers. The main floor plan is comprised of the master bedroom featuring a walk-in closet and updated ensuite. A second bedroom, lovely updated kitchen, eating nook, full bathroom and sunken living room make up the rest of the main floor plan. The additional square footage in the lower level features a sprawling third bedroom, bright and open family room, laundry, 2pc bathroom (possible to add shower), and large storage area. You'll love the fenced backyard with stamped concrete walkways & grass area for kids or pets! A single detached, insulated, heated garage with 220 power is another bonus to this property. Other features include A/C, S.S. appliances, fresh paint, gas outlet on deck, storage shed & RV parking. The home fabulously located at the end of the cul-de-sac & close to parks, elementary schools, trails, shopping, UBCO and airport.